Determining the space between you and your goals is as simple as looking at that space between your ears. Everything you have ever determined to hold you back from your dreams was either created, or has lived, in that space. Those people who hold you back, the reasons you “can’t” do something, the setbacks you experience, and all the chips stacked against you, may very well exist, but their power is only derived and empowered by your mind. 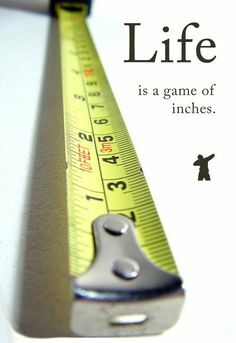 Life is a game of inches, and everything you’ve ever wanted from life starts with taking control of that six inch span from one ear to another. If you give life, people, obstacles, and setbacks a single inch of that space, they are all going to take a mile…along with your self-confidence, your will, and your determination. There will be times where it feels like you have surrendered that space to life, along with your hopes, dreams, and future. But the first step in taking back those inches lies in having the courage to simply decide.